Welcome to our May gathering of our Cottage Cooking Club where we monthly share dishes from the cookbook River Cottage veg everyday, by British author and TV cooking host, Hugh Fernley- Whittingstall. Hosting the group, ‘our fearless leader,’ as I affectionately call her, out of Bonn, Germany, Andrea, the Kitchen Lioness, Notes from a Very Small German Kitchen. This day of the 28th, collectively cooking our way through all the offerings in this cookbook, we together join online sharing those dishes that we have prepared from among the monthly line up carefully selected by Andrea, local and seasonally based by recipe ingredients, or as best possible. This is the first month since joining the Cottage Cooking Club last June (yes, it will be a year this upcoming month) where I literally prepared all of my months dishes in one day. Generally, eager to begin the selections, I set right out to intermittently purchasing my needed ingredients before systematically testing the recipes. Only this month had a different sort of ‘busy-ness’ to the schedule, including lots of food programs and events having me most frequently out and about. And so here I was, two days before deadline, and thus in less than twenty-four hours creating and preparing each of my chosen dishes as part of an impromptu Memorial Day weekend barbecue for a dozen friends and neighbors. Whew. 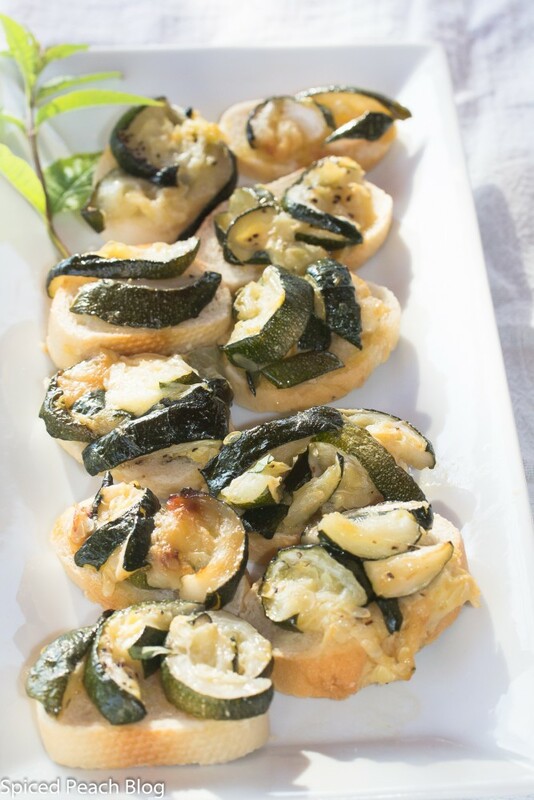 A selection of bruschettas served as hors d’ oeuvres, including this months Courgette Bruschetta (zucchini, shown above) these went over nicely and I thought the recipe was very good with the fresh lemon juice sprinkling along with salt and pepper to finish. 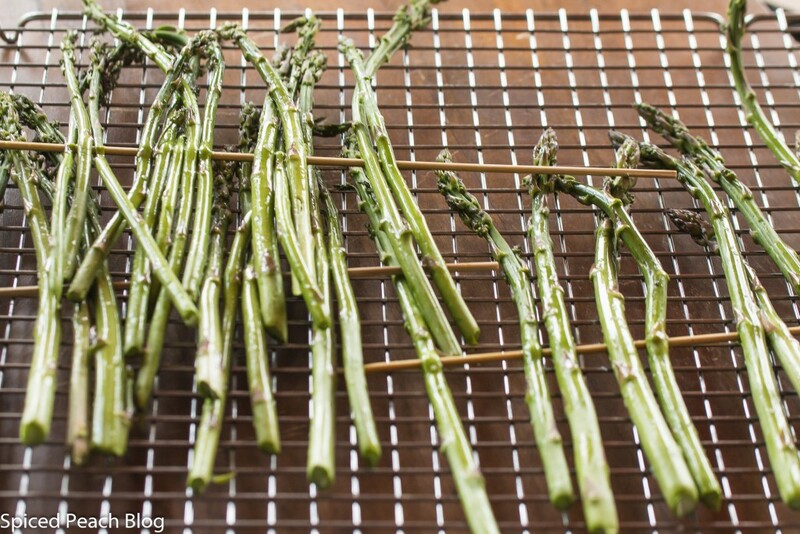 Also prepared were the Griddled asparagus spears with lemon dressing, sounds easy enough, right? Yes, skewering these delicious spears just picked from a nearby farm gave them a rather dramatic flair with the flavor imparted, once grilled, an almost nutty finish, and so recipe two, also got mine, and the groups seal of approval. Given the timing of our clubs end of month gathering requires producing a photograph on each of these dishes such as the Pasta with Broccoli above, another of my months selections, using Rienzi brand Spirals 38 (also called cavatappi.) With abundant kale in my garden, this dish served combined with pre-blanched broccoli and kale, later tossed into a saute of tender onions, garlic, and some red pepper flakes which I had to substitute for the red chilie peppers as I must have bought the area supply or something having prepared lots of Vietnamese foods the week prior using lots of these peppers, for they were literally, at least temporarily, no where to be found when I needed them again. Anyway this dish topped off with plenty of fresh cracked pepper and lots of fresh grated Parmesan cheese was lovely to display as well as to eat, with guests in full agreement. Well, all except Frani, that is, who just hasn’t been able to tolerate broccoli over the past couple of years but this discretion was made up for with plenty of other choices otherwise, including Bob’s ‘smokin’ smoked ribs below, with perfectly spiced seasoning served alongside homemade barbecue sauce, and Peggy’s grilled Chicken Tikka legs, adapted from the awesome recipe of Steven Raichlen, one among some serious amazing global grill recipes in his television program series, primal grill. Oh, did you notice my homemade pickles on the front of the table? Delicious. Determined to capture at least a couple of photographs at some sort of dining event at my home, including people and food, I decided to make the smaller buffet table a make-shift scene on the grass beneath the deck after a.) asking guests to humor me taking a few photo shots just before dinner b.) enlisting the young girls at the house behind us to help set up the table and buffet. 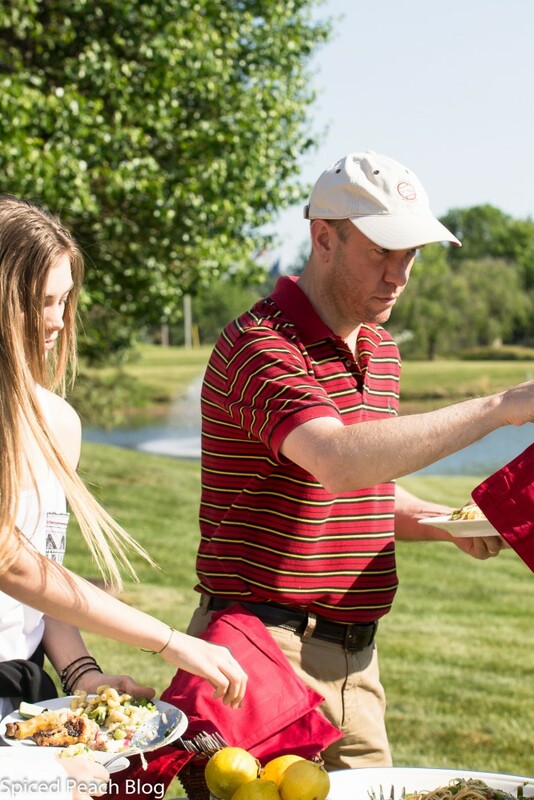 Incidentally, these three girls in the party photos above are the nieces of Lynn Lampe Lindquist, “Cook on Call” who I recently featured on her Personal Chef Service on Spiced Peach Blog, with her brother, Steve, being the dude in the sports cap below. Naturally, in my first chance ever to capture the moment, the sun at the back of the house was blazing and grilling as hot as a red flaming bbq coal, the glare even setting off my flash. Boo hoo to you sun that won’t dim to perfect softness at my precise beckoning. Soon. Very soon, like seconds later, guests began asking where they should put the other platters of food yet to set on a buffet, Oy Vey, I should’ve just set out the big long tailgate table but I had been worried about needing more fill in decorations… you know, the extra fussy stuff, making shots ‘photo worthy’ boy this picture taking thing while hosting a party is really, really tough. Did I mention this was a less than twenty-four hour impromptu barbecue, fulfilling each of my Cottage Cooking Club dishes for the month all at once? Fortunately, already fitted on the table was the final of my this months selections, Herby, peanutty, noodly salad. Although increasing amounts for this salad to serve a crowd, being an old Tailgating pro as I am, I could tell just by quick look at the recipe measurements, that proportionately, the sauce amounts would surely not be enough to fully flavor the pasta, and given absorption, if not serving immediately at least. Easy enough, the dressing was prepared with the usual suspects for a cold Asian noodle dish, rice vinegar, lime juice and zest, garlic, brown sugar, sesame oil, soy sauce, and red chilies, again, the red chilies, of which I did not have, substituting long hot Korean pepper. Asian noodles tending a more delicate composition than dried pasta for this dish I used thin spaghetti, doubling the dressing per portion. And for this dish, my friend Mike liked the balance, but Steve and Patie voted for even just a bit more dressing of which I concur, still, Herby, peanutty, noodly salad was very much enjoyed by all. A lovely early weekend day in New York making a presentation at Thomson Reuter’s Times Square on exotic Vietnamese ingredients as part of Asian Pacific American month, picture perfect weather (well, all except photo sun glare), and sharing an impromptu barbecue with some friends and neighbors, and with another busy week coming up, meeting deadline for our Cottage Cooking Club, all combined, a great kick off to the summer season. And today, Memorial Day, a national American holiday, as we make our way to swimming pools, shore destinations, and other festive warm weather events, time for a brief reflection, thanks, and appreciation for all of those Veteran’s and American Service People, those given their lives for our freedom, and sustain us still today. Thank You to these brave and loyal soldiers, God Bless America. To see what other Cottage Cooking Club members have prepared this month just click here. Thank you to Andrea for her continued efforts in creating a perfect cooking club with fabulous members, always welcoming others to join in. This entry was posted in Cottage Cooking Club, Veggies and tagged Courgette Bruschetta, May Cottage Cooking Club, River Cottage Veg Everyday, The Cottage Cooking Club. Bookmark the permalink. Post a comment or leave a trackback: Trackback URL. Everything looks great, Peggy! Your buffet table is lovely. Don’t worry about the party shots. Your story telling is so rich, readers can make the movie in their own head. And your food photography jumps off the page…such a gift. Thanks so much Kelly! Your kind words mean a lot and you always make my day! Hi Peggy, always love the way you tell a story, I feel like I should grab a cup of tea and take the time to sit back and read. Beautiful pictures and pics….you outdid yourself. Hi Cheri, so kind and nice of you! Thanks so much! So Happy to see you Cheri and hope you are feeling OK. See you soon. Wonderful photos, Peggy! I would never even attempt it with guests. And your food looks lovely, especially the bruschetta which I have yet to make. It looks and sounds as though you had a great weekend. Hi Zosia, Thank you so much. I know- it is so hard to take photos with guests, wish I had some natural knack (or a little fairy flying around clicking away.) It was a good weekend, and nice dishes this month, quite easy too, looking forward to seeing everyone’s Posts! 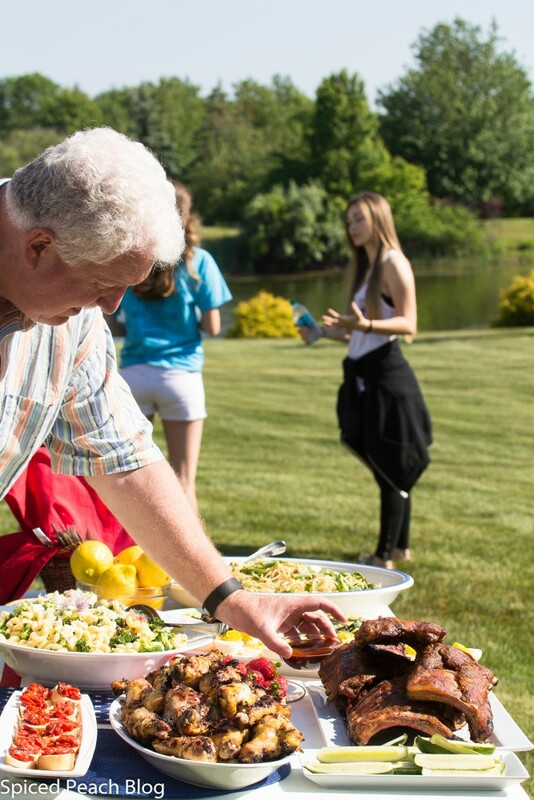 Dear Peggy, your post is leaving me a bit breathless – so many wonderful dishes you prepared for your impromptu Memorial Day party – it certainly looks as if you all had a wonderful time and I most certainly like your shots of the party folk/guests. Trust me, it is next to impossible to take pictures of happy guests while hosting the party at the same time – it just does not work. I suspect, there are quite a few photographer friends helping out – personally, I cannot do both. And those lovely compatriots seem a bit camera shy as well…Be that as it may, we loved the salad (with extra dressing as well) and we loved the courgette bruschetta too. And the griddled asparagus is definitely gorgeous looking! 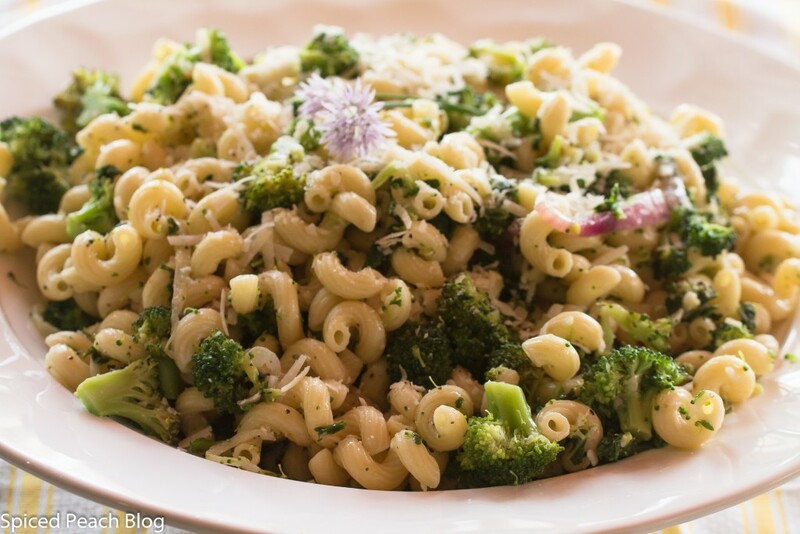 I have decided that the Pasta with Broccoli is one of those recipes that my kids will have to learn to make asap. Hi Andrea, Thank you so very much, and, for all you do in coordinating our lovely Cottage Cooking Club. So happy that you and others are in the same court as me finding it extremely difficult to photograph parties where we are preparing the food and entertaining. I think this is one of the difficulties in blogging as well, after preparing many terrific dishes and later having to prepare a whole new dish to put onto the blog- or- making it again, then there is the time in re-purchasing ingredients and prepping them. One thing is for sure, blogging is far more than it appears! See you soon on the Kitchen Lioness, I’ve already read your Post but since I enjoy your photographs so much I always go back a second time! When I sat down this morning, with my second cup of coffee, to read your post I will admit to looking forward to what story you were going to tell us this week. Besides your good veggie selections, you always have something fun to tell us about your activities. And, this one was a humdinger. I can just visualize you (although I do not know you except virtually and by your nice picture) gearing up to do a one day-CCC marathon. Well done, Peggy. You pulled it off. I think you are the only CCC colleague who made courgette bruschetta. It does look delicious. Of course, the asparagus. And, binding them together on the grill is not only a good presentation but saves you from losing a few of those stalks. The noodly salad – I didn’t get it made – is a must, must, make soon. 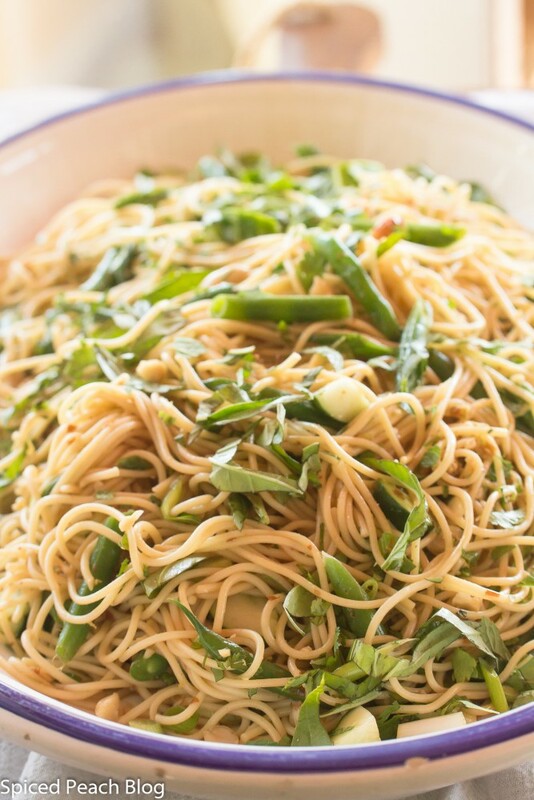 Your pasta dish, great idea, and always a flavorful filler on the buffet table. Those grilled meats…wow. Michael was my grill guy. He was masterful. That’s one of the many things I miss, miss, miss about him. I never even stepped up to the grill so am impressed with your Chicken Legs. All in all, Peggy, a delightful and ambitious CCC post. Very nicely done. And, your right, it does take a bit of effort to pull it all off and do it all. I always think by doing it, I record a nice memory. Still, you start with an idea, make your grocery list and then hope it all ends well !!!! Your CCC day and buffet and party certainly appears as if it was enjoyed by all, including we readers. Well done, Peggy. Thanks for the pleasurable reading. Hello Mary, Thanks so much on all, and I was eager too for your post to come up sharing your latest Colorado, and otherwise travel adventures! You really do such a terrific job capturing the events at your home with the expressions and timing of photos so well placed between your friends and so true, it does record a nice memory. See you over the month in your upcoming travels, and eager to see what you will also be up to in the kitchen, with the finish of French Friday’s with Dorie! Peggy, your party shots are perfect. Makes me want to jump right in and dig into that delicious meal. I also made the noodle salad. Delicious! And, I liked your shout out to our friend Mary. She knows how to involve her friends in all her meals. Hello Betsy, thanks so very much. The noodle salad was quite good. I’ve been enjoying your Dorie wrap ups among your group, what a huge accomplishment! Wow! I am ever-impressed. What a delicious barbecue spread you put out. What lucky guests! I am quite impressed by your photos. You have people in them, which is one step ahead of me! Usually I’m lucky if I snap a quick photo of the food. Thanks so much Jora! So now we are both in the same camp- I’m just catching up on commenting returning from vacation! Oh yes, barbecues are so much fun, and so delicious too. I’m thinking the people thing is perhaps a bit too much work for me on a regular basis anyhow! Thanks again for re-visiting!